Lending against gold is not a low-default business. Rather, it reports lower losses when defaults happen simply because the loans are secured by the precious metal. Even when gold prices are falling, risks increase, but only a bit as non-performing assets are auctioned and the money is recovered. But, when the loan value is a high portion of the gold taken as security, auctions are delayed owing to regulatory restrictions or otherwise and gold prices fall, a crisis in earnings is around the corner. That’s precisely what has happened to Manappuram Finance Ltd. Before the Reserve Bank of India’s clampdown on interest rates and capping of advances at 60% of the value of jewellery, gold loan companies were on a credit spree. 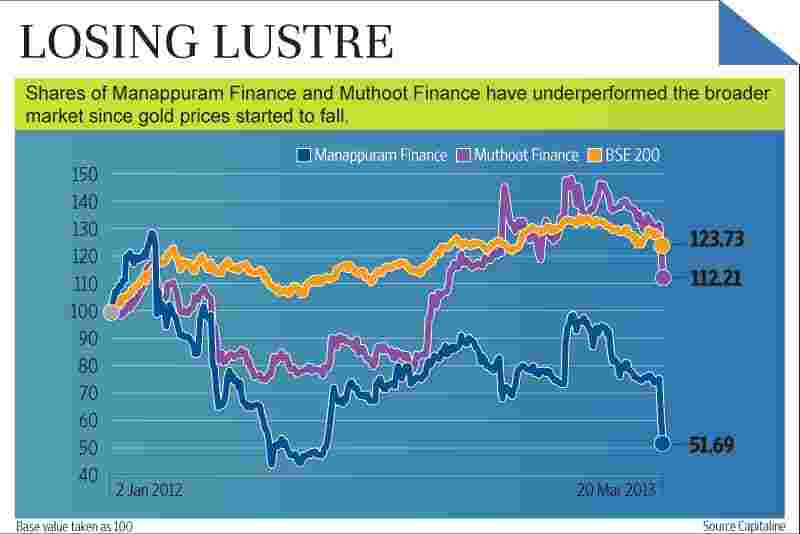 Manappuram had lent some ₹ 10,500 crore in the quarter ended December 2011, analysts say. A portion of these loans were one-year bullet payment loans but have turned bad. Here’s how it happens: A ₹ 90 loan is taken for a collateral of ₹ 100 worth of gold jewellery. At a 25% interest rate, the amount the financier hopes to collect a year later is ₹ 112.5. If in the meanwhile the value of the collateral falls to ₹ 95, it’s an incentive for borrowers to default. Sure, unless prices fall sharply, there are unlikely to be losses on the principal amount. But companies typically spread interest income over four quarters. Thus, such a situation forces them to reverse interest income. In Manappuram’s case, about 15% of loans disbursed in the third quarter of the fiscal year are under stress because of high loan-to-value ratios. The management has estimated a ₹ 50 crore loss in the March quarter. If auctions worth some ₹ 1,000 crore are pushed into the next financial year starting April and gold prices fall further, the under-recoveries could be higher than the budgeted ₹ 250 crore and lead to more income reversals. No wonder, many brokerages have pruned their fiscal 2013 earnings estimate by one-third for Manappuram. The shares have lost one-third of their value, too, in the past couple of days. In a rub-off, Muthoot Finance Ltd’s shares have also fallen. But the latter may be less affected by falling gold prices. That’s simply because at the end of the December quarter, Muthoot’s average loan-to-value ratio was 64%, while Manappuram’s hovered at 70%. Since these are legacy loans, “such instances of income reversal should not recur due to lower LTVs (loan-to-values) and lower interest rates on the loans issued post February 2012 (unless gold prices fall by more than 10% within a year)," says a note from Ambit Capital Pvt. Ltd on Manappuram. Still, the outlook is none too bright for the industry. In a tough environment, advances are not picking up pace. Only a resurgence in credit growth can bring back the sheen to gold loan stocks.